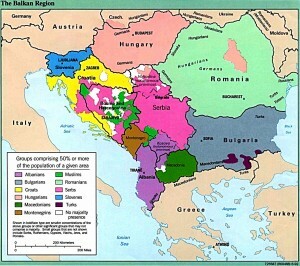 The quarrels after Balkan wars and the independence of Kosovo in Serbia are still palpable, and they come to light with the slightest excuse. The last debate between the two countries has to do with a picture from Miss Serbia, Anja Saranovic and Miss Kosovo, Aferdita Dreshaj, together in Sao Paolo (Brazil), during the celebration of Miss Universe on 12 September. The snapshot, released by the young Kosovan Facebook has done in the arena of politics in both countries led to a real diplomatic crisis. Some Serbian media denigrated his fellow “traitors”, while socilitaban his public apology. The miss of 21 years said that despite the photograph, she “supports the policies of their country,” and that its action “does not mean recognition of the state of Kosovo, because Kosovo is Serbia is Serbian Jerusalem,” stated. Miss Kosovo, for their part and although certain websites in your country will remember “the bloodshed by thousands of parents, siblings and children for the cause in all these years,” has refused to make any public comment still preserves the picture on your Facebook profile. Information about Miss Kosovo and Miss Serbia. What happens with the photo of these girls from Serbia and Kosovo? All this has generated strong opinions, some newspapers in Serbia have said that it seems like a betrayal by his deputy, Anja Saranovic. The Miss has had to speak to the middle making it clear that 100% supports the policies of your country. On the other hand, the representative of Kosovo, Aferdita Sreshaj has refused to make any statement about the photo. If do you want to know more about serbian girls check this page. And if do you want to know more about kosovo girls come to this page for to have more information about. We post more articles with information to travel to the Balkan places, cities, beaches and more useful information for travellers. Do you want to learn Serbian phrases and travel words? Visit our page and know more about Serbian and Kosovan phrases and words before your travel to visit the Balkans.